BEAVER, W.Va. - In the biggest settlement ever reached in a U.S. mining disaster, the new owners of the West Virginia coal mine where 29 men were killed in an explosion agreed Tuesday to pay $210 million over a tragedy the government blamed on the ruthless pursuit of profits ahead of safety. The money will go to compensate the grieving families, bankroll cutting-edge safety improvements and pay for years of violations by Massey Energy, owner of the Upper Big Branch mine at the time of the April 2010 blast. Under the deal, Alpha Natural Resources  which bought Massey earlier this year  will face no criminal charges in the explosion as long as it abides by the settlement, U.S. Attorney Booth Goodwin said. But "no individuals are off the hook," Goodwin warned, adding that federal prosecutors are still investigating former Massey managers. Charges have been brought against only one person so far: the mine's former security chief, Hughie Elbert Stover. A federal jury convicted him last month of lying to investigators and trying to destroy mine records. He is awaiting sentencing. The settlement was bitterly criticized by some of the dead men's relatives, who said they won't be satisfied until charges are filed against those they consider responsible for the catastrophe, the nation's deadliest mine accident in 40 years. Gary Quarles, whose son Gary Wayne Quarles died in the disaster, said: "I want to hear names, and I want to know what they're going to be charged for. Today would have been a fine day for them to have told us." Hours after the settlement was announced, the U.S. 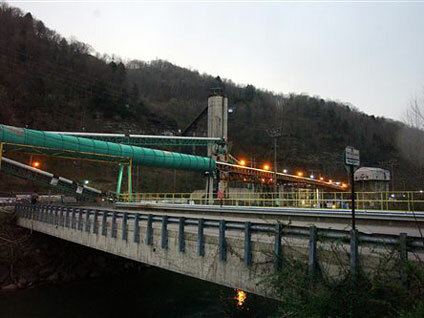 Mine Safety and Health Administration released a final report on the blast that detailed 369 safety violations at Upper Big Branch, including 12 it said contributed to the explosion. MSHA labeled nine of the violations that led to the accident as flagrant, the most serious designation, and said they included illegally tipping off miners that inspectors were on the site and failing to conduct proper safety inspections. "The physical conditions that led to the explosion were the result of a series of basic safety violations at UBB and were entirely preventable," the report said. The report confirmed what the agency and other investigators said previously: that Massey allowed a buildup of highly explosive methane gas and combustible coal dust, and that worn and broken cutting equipment created the spark that ignited the fuel. Also, investigators said broken water sprayers allowed a mere flare-up to turn into an inferno that ripped through miles of underground tunnels and killed men instantly. "Every time Massey sent miners into the UBB Mine, Massey put those miners' lives at risk," said MSHA director Joe Main. "Massey management created a culture of fear and intimidation in their miners to hide their reckless practices. Today's report brings to light the tragic consequences of a corporate culture that values production over people." The settlement consists of $46.5 million in restitution to the miners' families, $128 million for safety improvements, research and training, and $35 million in fines for safety violations at Upper Big Branch and other Massey mines. The deal seeks to guarantee that the families of the 29 dead miners and two co-workers who survived the explosion will each receive $1.5 million. Those who accept the payout can still pursue lawsuits, but the $1.5 million will be deducted from any settlement or jury award. At least eight families of dead miners previously settled with Massey. Alpha CEO Kevin Crutchfield said the company cooperated fully with authorities and believes the agreement represents "the best path forward for everyone." "We're particularly pleased that a substantial portion of the settlement is going towards furthering miner safety, which has always been Alpha's guiding principle," he said. The deal was seen as precedent-setting, not just because of the amount of money, but because a lot of it is going toward research that could make mining safer. It was also seen as an attempt by Alpha to put the scandal behind it. Well before the disaster, Massey had a poor safety record, and the coal company and its hard-nosed CEO, Don Blankenship, had a reputation among their union critics for treating fines as the cost of doing business. MSHA said its investigation found "systematic, intentional and aggressive efforts" by Massey to cover up problems, including keeping two sets of inspection books  an accurate one for itself, and a fake one for regulators. The federal agency also said it will conduct an internal review of its own actions at Upper Big Branch. Relatives of the victims and officials with the United Mine Workers union have rebuked MSHA for not shutting down the mine before the tragedy. Under Tuesday's settlement, Virginia-based Alpha will invest $48 million in a mine-safety research trust and spend an additional $80 million to improve safety at all of its mines with the latest technology. The improvements will include coating mines with crushed limestone to reduce the risk of a coal-dust explosion; using digital sensors to continuously monitor air flow and methane levels; and adopting emergency oxygen equipment, similar to what firefighters rely on, to give miners an uninterrupted supply of air while trying to escape from an underground accident. "This in several ways is a revolutionary resolution," Goodwin said. "We wanted it to be something constructive and forward-looking." Clay Mullins, whose brother Rex died in the mine, said he wants to see criminal charges brought against executives at Massey, not just against low- and mid-level managers. "It was an act of murder," he said. "They murdered 29 men, and I'm not satisfied one bit." Mullins said he also believes MSHA bears some responsibility. MSHA coal administrator Kevin Stricklin defended the agency, saying that his inspectors shut the mine down 48 times in the year before the blast but had to allow it to reopen when problems were fixed. He said MSHA lacked the authority to close it permanently and still does. "We thought we were keeping accidents from happening," he said.